Agile Serbia and Finesa publishing house organized promotion of the first book about Scrum in the Serbian language – “Scrum: The Art of Doing Twice the Work in Half the Time” by Jeff Sutherland, on the November 29th, at the ICT Hub, in Belgrade. Jeff Sutherland is famous about Scrum, since he is a co-creator of Scrum framework, one of many under the umbrella of Agile. Scrum is definitely very interesting topic since ICT Hub space was full of numerous participants last night. Interesting fact, IT community was in majority, as expected, but large number came from non IT companies and without practical experience in Scrum. This is encouraging as well because Scrum obviously does not recognize limits, although traditionally belong to IT sphere and software development. 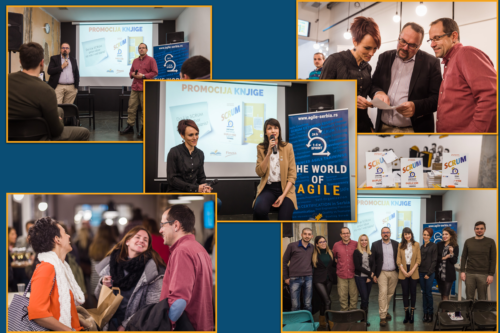 At event’s beginning guest were welcome by Lidija Maričić, in front of Finesa publishing house, and Jelena Ristić, director of education in Agile Serbia by Puzzle Software. Lidija spoke about book, about idea for this edition and Agile Serbia team who recognized it, as a unique way to promote positive changes and values, which is common thing for both companies, as well as Scrum’s value above all. Jelena Ristić introduced participants with Agile Serbia community, it’s activities, goals and values, also with previous achievements and plans for the future period. The most important part of the evening belonged to Scrum, with Zoran Vujkov and Predrag Rajković, team members of Agile Serbia, as a main actors on the stage. Concept was in the stand-up form, so participants had a lot of opportunity for interaction with speakers who introduced them with Scrum far beyond it’s theory. Vujkov has professional experience in software development for more than 20 years, working from small companies up to large corporation, and some of his experiences he shared with participants. Predrag Rajković as a Product Owner has reputable experience in practice of Agile implementation, and he is a coach of Lean and Agile methods and techniques as well. Speakers introduced participants with basis of Scrum, it’s values and process of implementation. They spoke about numerous examples of Scrum application in practice, about good practice and bad practice. It was revealing of Scrum since they spoke about failures during implementation, but positive experiences as well. The message was that you have to be Agile all the time if you want apply with Scrum. Participants asked questions in the final part of the event, they were mostly curious about Scrum and benefits for themselves, when they should and when shouldn’t go with Scrum? The event was closed with cocktail where participants had opportunity to discuss more on Scrum further with speakers and organizers, to share their own experiences and make new contacts. Which is additional positive side of this event. And we hopefully expect some new edition with a lot of joy soon.